Morecambe boss Jim Bentley has made an early plea for fans to take advantage of the Shrimps’ Easter Monday ticket offer. The club has reduced ticket prices to just £5 for the Bank Holiday game against Cheltenham Town in an effort to draw in a bumper crowd and Bentley has made a plea for supporters to take advantage of the deal. The aim is to get close to the record Globe Arena league crowd, which stands at 4,165 for the clash with Carlisle United on Boxing Day 2014. As well as cut price football the Shrimps will be holding a family fun day with something for everyone, organised by the Shrimps Trust working with MFC Community Sports. 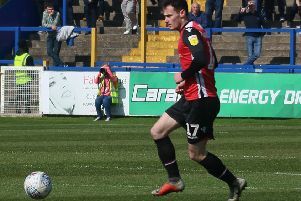 Before then, however, Bentley is also putting pressure on his side to set the game up perfectly by clinching a fourth successive home win at the Globe Arena on Saturday when his side meet Grimsby Town. They welcome the Mariners after winning three straight home league games for the first time since the 2009/10 season – as well as at the Globe Arena. Bentley said: “Since the move to the Globe Arena our home form has always been a bit of a disappointment, but the recent wins over Forest Green, MK Dons and Crawley have really lifted everyone’s spirits and hopefully we can finally get a real run of results together at the Globe. “It would be fantastic to get a fourth win in a row as that would really set up the Cheltenham game perfectly. “Grimsby are not in the greatest form and are one of those sides with little play for so it is a good fixture for us. “It makes a massive difference to a club to win regularly at home. It really gives supporters something to look forward to and makes the whole atmosphere much more positive. “The Cheltenham offer is a fantastic gesture by the club and we need as many people as possible to take advantage of it. “There’s a nice feel good factor around the place at the moment and we are keen to keep that going for as long as possible. “I will be making sure the players give their all but we want the fans to come out, regulars or not, to come out and get behind their local side and help us finish the season as strongly as possible. Fans wishing to take advantage of the Easter offer need to get their tickets in advance as admission prices revert to normal price on the day. For details contact the club on 01524 411797.